The bigleaf mahogany (Swietenia macrophylla), is a tree endemic to the Neotropics that can grow up to 45 m, in height and 2 m in trunk diameter. It is harvested for its highly-valued timber, to make furniture, panelling or musical instruments, and has been widely planted outside its historical range. Thus Fiji, Bangladesh, India, Indonesia the Philippines are now major exporters of plantation-grown timber. Meanwhile, however, original wild populations have declined significantly and timber from the Neotropics (specifically logs, sawn wood, veneer sheets and plywood) is currently included in CITES Appendix II. The introduction below summarizes the actions taken by CITES to protect the bigleaf mahogany. The history of Swietenia macrophylla and CITES goes back to 1992 when Costa Rica and the United States of America submitted, at the eighth meeting of the Conference of the Parties (CoP8, Kyoto), an unsuccessful proposal to include this species in Appendix II. At CoP9 (Fort Lauderdale, 1994), the Netherlands submitted a proposal to the same effect and with the same lack of success. 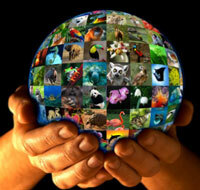 In 1995, Costa Rica included the species in Appendix III, restricting the listing to the populations in the Americas. A new proposal to include the bigleaf mahogany in Appendix II was rejected at CoP10 (Harare, 1997). Nevertheless the Conference of the Parties decided at that meeting to establish a working group, comprising the range States and importing countries, in order to examine the conservation status of the bigleaf mahogany and make recommendations to ensure sustainable international trade. After that meeting, Bolivia, Brazil and Mexico listed their populations of Swietenia macrophylla in Appendix III. At CoP11 (Gigiri, 2000), Brazil reported in document Doc. 11.38.2 on the conclusions of the working group, which had held a meeting in that country in June 1998. The countries party to the Tratado de Cooperación Amazónica (Amazonian Cooperation Treaty) reiterated their commitment to comply with all the obligations relating to the listing in Appendix III of Swietenia macrophylla in the region. Discussions at CoP11 led to the establishment of the Bigleaf Mahogany Working Group, whose mandate was detailed in Decision 11.4. After that meeting, Colombia and Peru also listed their populations of Swietenia macrophylla in Appendix III. Various range States of Swietenia macrophylla as well as the main importing countries at the time (Argentina, the United Kingdom and the United States) attended the first meeting of the Bigleaf Mahogany Working Group in Santa Cruz de la Sierra, Bolivia, in 2001. Participants in that meeting also included the Food and Agriculture Organization of the United Nations (FAO), the International Tropical Timber Organization (ITTO), the International Wood Products Association (IWPA), the World Conservation Union (IUCN), the World Wide Fund for Nature (WWF) and the CITES Secretariat. At its 12th meeting, the Conference of the Parties considered the report of the Bigleaf Mahogany Working Group (see document CoP12 Doc. 47) and Guatemala and Nicaragua made a proposal (CoP12 Prop. 50) to include the neotropical populations of Swietenia macrophylla in Appendix II, covering only logs, sawn timber, veneer and plywood. The proposal was adopted and came into effect on 15 November 2003. The Conference of the Parties agreed at the same meeting to maintain the Working Group but gave it a new mandate which was recorded in Decision 12.21. The second meeting of the Bigleaf Mahogany Working Group was held in Belem, Brazil, in October 2003, and resulted in a series of recommendations. Twelve of the 17 range States of that species attended, as well as two of the main importing countries (the United Kingdom and the United States), a representative of the CITES Plants Committee, ITTO, Instituto do Homem e Meio Ambiente da Amazônia (IMAZON, Amazon Institute of People and the Environment), TRAFFIC and the CITES Secretariat. The recommendations of the Bigleaf Mahogany Working Group were presented at the 14th meeting of the Plants Committee (Windhoek, February 2004) in order to establish priorities and to seek practical advice on their implementation [see documents PC14 Doc. 19.1 (Rev. 1) and PC14 WG7 Doc.1, and the PC14 summary record]. The Working Group completed the tasks allocated to it in Decision 12.21 with the presentation by Brazil of a report (document CoP13 Doc. 39, Annex) at CoP13 (Bangkok, 2004). At the same meeting, the Conference of the Parties decided that the Bigleaf Mahogany Working Group would continue its work now under the Plants Committee (see Decisions 13.55 to 13.59). At its 15th meeting (Geneva, May 2005), the Plants Committee made a statement specifying the new mandate of the Working Group and its composition. Later on, the Bigleaf Mahogany Working Group submitted its work plan (see document PC16 Doc. 19.1) at the 16th meeting of the Plants Committee (Lima, July 2006), and which, in accordance with Decision 13.56, shall presented a report at CoP14 (The Hague, 2007) on the progress it had made. The Conference decided to renew the Working Group's mandate and adopted Decision 14.145 together with an Action plan for the control of international trade in the bigleaf mahogany (Swietenia macrophylla)toset up new directions for work on this species. document PC18 Doc. 13.2 on Progress report on the joint CITES-ITTO timber project. Between 2007 and 2009, the joint ITTO-CITES cooperation programme also funded two meetings on mahogany (see Meetings on the bigleaf mahogany for details). At CoP15 (Doha, 2010), Decision 14.145 was replaced by Decisions 15.91, 15.92 and 15.93. At the same meeting, the Conference of the Parties revised Decision 14.146 and its related 'Action Plan for the range States of Cedrela odorata, Dalbergia retusa, Dalbergia granadillo and Dalbergia Stevensonii'. It decided that work on Cedrela odorata would also be tackled by the Bigleaf Mahogany Working Group. The Group was thus renamed 'Working group on the Bigleaf Mahogany and Other Neotropical Timber Species'. In conclusion, there is no doubt that the Parties have made great efforts to promote the conservation and sustainable utilization of the bigleaf mahogany since its inclusion in Appendix III in 1995. However, significant progress remains to be made in most range States. There is no doubt that Parties will continue making progress on the implementation of CITES for this valuable species for the next years to come. II Taller Latino Americano del Proyecto ITTO-CITES para asegurar que el comercio internacional de las especies maderables incluidas en CITES es consistente con su manejo sostenible y conservación: Experiencias en la aplicación de coeficientes de rendimiento para el control y monitoreo de la actividad maderera” Lima (Peru), 21-23 April 2009. Click here to visit the website of the International Tropical Timber Organization (ITTO).